Great start, right? Well of course, there’s two sides to everything. Variety reports that it will be a remake of the 1969 John Wayne Western “True Grit.” Unfortunately, I can’t provide much detailed analysis of “True Grit” because I haven’t seen it yet. What I do know is that it’s about a drunken U.S. Marshal who helps a 14-year-old girl find her father’s murderer. Also, this film earned Wayne the first and only Oscar of his career (likely to make up for snubbing his performance in “The Searchers”). Now, I pretty much always express outrage when Hollywood decides to remake classics. While someone had the decency to kill that “Rosemary’s Baby” remake, that proposed “Bonnie & Clyde” remake has yet to be shot down. And while I’m not surprised that someone like Michael Bay (who was on board for the “Baby” remake) would try and ruin a classic, I would never expect it from the Joel and Ethan Coen, who have come up with some of the most amazingly original stories of the past 30 years. There isn’t really much good to remakes, but some people do defend them. Often, they can be good, but that’s in the rare circumstance where the director takes the old film and puts a new spin to it that’s entertaining and unique. Perhaps the Coen Brothers are just the people to do that. It already seems that they’re planning on telling the story from the girl’s perspective (apparently in the original, the story is told from the perspective of Wayne). Not only that, but the Coen Brothers shoot most of their best films west of the Mississippi. Adding their unique eye to regional accents and mannerisms probably couldn’t hurt the film either. They can also shoot a pretty good shootout, too. So, take this project as you will. While I know the Coen Brothers are capable of inventing their own stories, I’ll still probably line up for anything with the names Coen and Bridges on it. 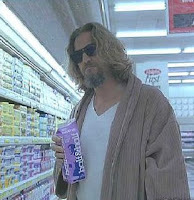 This entry was posted in Big Lebowski, Jeff Bridges, John Wayne, Remakes, The Coen Brothers, The Dude, True Grit on September 11, 2009 by ian0592.